Creators have been known to come into the store from time to time, and I’ve had the pleasure of greeting them and having short conversations with them. One of my first experiences was meeting Matt Fraction, Ed Brubaker, and Brian Michael Bendis one day, about a few months into my tenure. My co-worker Ken happened to go up to Matt Fraction, and proceeded to tell him he loved his work, thinking it was Ed Brubaker. Ed and Brian were actually in the next aisle over. Matt called Ed over, and then Ed proceeded to look directly at me and charge me. I immediately put my hands up in defense and told him that I loved Captain America (at this point Bucky had just become Captain America and Steve Rogers was still “dead”). Ed then asked me if I was reading Criminal, I told him that I was waiting for the Deluxe Hardcover. We then had a conversation about Criminal, Iron Fist, and how much I enjoyed his work. I don’t keep in touch with Ed, but I am still Twitter friends with Matt Fraction, and all of those Fear Itself questions I did on the blog were thanks to the fact that we talked. Geoff Johns and Jim Lee: This one is special to me because it was a midnight release for Justice League #1, and the launch of the New 52. The excitement at the time was really high, and the enthusiasm showed by both creators and the fans was a sight to see. DC did a fantastic job of highlighting their big launch by providing two of their biggest talents for the public to interact with. Olivia Munn: One of the few celebrities I’ve seen, Olivia was an interesting one. She was a little late to the signing, but she’s one of the most gracious signers I’ve ever seen. She spent plenty of time with each person on line, taking pictures, accepting pies, and legitimately paying attention to each person. I’ve been to a handful of signings by non-comics people, but she’s definitely one of the best I’ve seen. We got out a little late that night, but the crowd loved the signing, and I am genuinely a fan of Olivia’s after seeing her. George Takei: A comics crossover with Kevin Keller brought George Takei into the world of Archie. It was an immense pleasure and privilege to work that particular signing. I was stationed right by the door, and literally, right as he walked into the store, he exclaimed “Oh MY!” Growing up, Star Trek was in syndication, and Mr. Takei’s Hikaru Sulu was very influential to me. That I was able to express that to the man himself was very satisfying and fulfilling. There are so many stories I can tell about creators, and about customers and co-workers, but I’m going to leave it at this: I spent six very rewarding years at Midtown. I’ve made friends in the industry and out, I’ve recommended books to thousands and thousands of readers, new and old. I’ve had people tell me that I’m the reason they’re into comics, or into a certain book. Those moments are most special to me, more than any signing or any celebrity sighting. 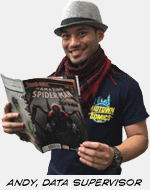 I wanted to work at Midtown Comics to recommend comics to people and to spread the love I have for comics. Mission definitely accomplished. It’s been a genuinely gratifying experience. If you shop at the store, I hope I was able to help you if we did interact. Midtown Comics Times Square is a huge store, feel free to stop in. The staff there has been trained very well (ahem, you’re welcome) and the spirit of enthusiasm as well as the knowledge is still in the store even if I’m not. I’m working on some writing projects, and any news and updates will be posted there. It has been my pleasure to sell comics to the world from the largest comics retailer in the world. Thank you all for reading.